Momentum Women’s Dissertation and Thesis Support group is a weekly informational and supportive group to answer questions and provide feedback during this challenging process. Group members increase skills, decrease a sense of isolation, and hold each other accountable for establishing and accomplishing goals. The group is offered year-round, but space is limited. 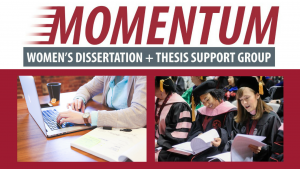 Each Fall, we host a reception for graduate students and supportive faculty members to fellowship and learn more about the Momentum Women’s Dissertation and Thesis Support Group. Check back for the Fall 2020 reception date! Call 205-348-5040 or email Dr. Kathy Echols to reserve your spot in the group!